The Danube is one major tourist trump of Budapest, but before it became this major sightseeing opportunity everybody knows, it played a considerable role in the shaping of the historical and economical trajectory of the city. At present, the Danube is a genuine tourist landmark of Budapest. For instance, it is crossed by the majestic bridges of Budapest, of which the Chain Bridge is, perhaps, one of the most impeccable expressions of 19th century architectural engineering, and it is also pegged out by further top attractions, such as Margaret Island or Hajogyari Island. Definitely, a stay in Budapest could not be deemed complete without making the experience of an unforgettable boat tour on the Danube. There are several companies in Budapest which capitalize on the tourist potential of the Danube. They offer boat trips on the river, and, in fact, some of them even turn a mere cruise into an event of special magnificence. Obviously, tourists do have a consistent range of alternatives, and it would be nothing but a loss to miss out the opportunity of checking out the Hungarian character of the Danube once in Budapest. Roughly speaking, Legenda offers two types of cruises. The day cruises include a stop on Margaret Island, but this call is only optional, though highly recommended. The content featured by audio-guides is available in 30 languages, and visitors can enjoy a fine range of beverages. This day cruise is put forward under the name of Duna Bella. 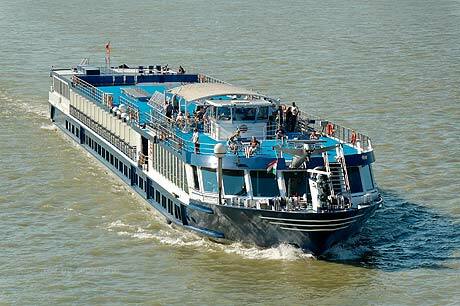 Danube Legend is the evening cruise. By choosing this tour, visitors have the opportunity to see some of the most eye-catching attractions on the riverside promenade of the Danube, such as the Parliament building, when illuminated at night. The explanations provided by audio-guides are, again, available in 30 languages. The company also organizes special events (private or corporate) on request. Program Centrum is a travel agency which does not focus exclusively on cruises on the Danube. Its offer is complemented by bus tours throughout Budapest. It also organizes bus tours to Vienna, which is no surprise, given the relatively short distance between the two capitals. The countryside sightseeing tours, as well as the leisure flights over Budapest are worth mentioning too, since they feature a special tourist significance. As far as cruises are concerned, the boat tours as such are always accompanied by sundry theme programs (cuisine or folklore-related or even cultural). The night cruises seem to be quite popular. Some of the highlights of the impressive cruise and sightseeing tour offer of Mahart Passnave refer to the Budapest-Vienna tours by hydrofoil or to the tours which start in Budapest and include stops in Visegrad, Mohacs or Esztergom. Walking tours are also available, but a special attention is paid to the day, evening and night cruises on the Danube in Budapest. Some of the day cruises also comprise calls at Margaret Island, whereas the evening and the night tours are always accompanied by theme programs (as a rule, cuisine-related). By resorting to Eurama, tourists have the opportunity to choose from a wide range of sightseeing tours in Budapest and its surroundings or, why not, even all the way to Lake Balaton. The bus tours in Budapest try to unveil to visitors all the major historical, architectural and cultural landmarks of the city, whereas the cruises on the Danube reveal sights like the Parliament building, the Budapest Citadel, the Central Market Hall, the Fisherman’s Bastion and, of course, the bridges over the Danube. The Jewish tour should also be mentioned, since this one features stops at the most important Jewish landmarks of Budapest: the Dohany Street Synagogue, the Holocaust Memorial Center and the Jewish Cemetery. Hungaria Koncert is one of the companies which provide the richest selection of tours in respect to the places where the tours are organized and to the means of transport. The thematic spectrum of these tours is, it too, considerably wide. As far as the Danube cruises are concerned, they are organized either during the day and accompanied by a lunch program, or in the evening, when sightseeing is complemented by a dinner program. The helicopter tours, as well as the sightseeing programs by car should also be taken into account by people who want to experience Budapest from all possible perspectives: by water, by air and by land. City Tour Hop on Hop off puts forward a solid and varied range of bus tours in Budapest, but it also provides hop on hop off boat tours on the Danube, by night or by day alike.